Because the previous pill was too strong, the MC made a new batch and head out to find Ye Jing and found her sitting with Bai Ruofei. When Bai Ruofei saw the MC, she suddenly stood up and became nervous. Ye Jing and the MC then found a secluded place to talk. Note: Ye Jing already knew that the MC was a girl after the incident with the MC trying to matchmake her with the MC's brother. Ye Jing asked if they should bring Bai Roufei to the teacher's office, but the MC had better ideas. The MC tied Bai Roufei up and made her swallow the Truth Pill. When other students saw Bai Roufei, they wondered if she had offended someone. She then tried calling for her, for someone to untie her. When other students questioned if she was Ye Jing's good friend/sister, she started pilling the beans because of the effect of the pill. "What did Ye Jin deserve to be liked by Master Ouyang? She isn't worthy of Master Ouyang at all. Every time I see her, I want to tear her up cheeky face. Unfortunately, I couldn't find an opportunity. Oh, she's such a fool. When we went to the Beast Mountain range, she didn't even know that I especially angered a sacred beast to try and kill her. But she was saved by that damned little white-faced Feng Jiu. Since I couldn't kill her, I'm going to ruin her instead. Isn't she close to that little white face? So I..."
Note: Little white face is a degradative term for a beautiful young man with white skin. It can also mean a boy toy or gigolo. She then revealed how she framed Ye Jing. The only thing that came to mind to all the students listening was, "What a poisonous woman!" Not far away, Ye Jing and Teacher Lu were watching and listening to her confession. Teacher Lu then ordered the students to release her from the pole and wait for the vice-president's verdict. The vice-president order for her to be expelled and blacklisted, never to be admitted to the academy again. When Teacher Lu left, the vice-president asked Mo Chen, who was sitting nearby how the MC did it, and if she used some kind of controlling technique. Mo Chen then responded that it was the work of a Truth pill. The vice-president was surprised since it was a long-lost pill. "This pill... is it the work of Feng Jiu? But he's a student who had just entered the Alchemy division. Even if he has that kind of pill, he shouldn't be able to make it, right? "The Truth pill is a 2nd rank immortality drug." Mo Chen responded, "It's not something a student could make when he's just been exposed to making pills." The vice-president then goes on to say that it would be good for the academy and for the MC. If the MC can't rank up to foundation realm, she still has something to fall back on. Guan Xilan finally returns and visits the MC. The was surprised that Old Bai is now able to talk. This is also the first meeting between Ye Jing and Guan Xilan. Ye Jing was also surprised that Old Bai can talk. The MC introduced the two to each other and excused herself to leave the two to talk. Ye Jing felt a little shy because what she pictured was different from the actual person in front of her. Guan Xilan talked about his travels with the mercenary groups before excusing himself to call the MC. The MC, Guan Xilan, and Ye Jing went somewhere to eat fishes. When the MC returned, Ouyang Xiu, a Prince from another sixth rank kingdom and Ye Jing's admirer. Ouyang Xiu challenged the MC three days later. The news soon spread around the academy. Just as the MC said, teacher lu fell unconscious and according to Mo Chen, he is sick. If he doesn’t get the right medication, he would die in 3 hours or if it comes later, he will forever be in a vegetative state. Another Teacher Lu remembered the MC’s warning about how teacher lu was sick but back then, the atmosphere was wrong so they thought the MC said it like a curse to teacher lu. Teacher Lu decided to go to the Alchemy division to get the MC but found that her dorm was surrounded by enchantment and he couldn’t break through it. He then called for the dean to personally come over but the dean just stood outside to wait. On the other hand, the Vice President went to the black market to find some clues of the whereabouts of the ghost Doctor. The president of the black market gave him a hint; look closer to home. The president of the black market found it funny that the ghost doctor became their student and they didn’t even know it. With the hint, the Vice President figures out that Feng Jiu is the ghost do it and told the dean. The president and Vice President stood outside the MC’s dorms to wait for her to wake up. Guan Xilan then took food meant for the teachers and placed them in front of the MC’s dorm. The MC woke up saying, who, who dares to seduce me with food. The MC agreed to have a look. She said she won’t know if she can save him unless she takes a look at him. The MC also figured out that she is the ghost Doctor. They promise to keep it a secret. The MC’s prognosis was that there was a blood clot in the teacher’s brain and she has to open a hole in his head. When they didn’t believe her treatment, she was about to walk away when the Vice President offered her meals from the teacher’s kitchen as a reward. After 4 hours, she finished the operation with her brother and two other physicians. The MC told her brother that she will be sleeping until noon the next day. The president and Vice-president visited her and asked her what prize she would like. She told them that she had already received it; three meals a day from the teacher’s kitchen. They then asked her why she enrolled at their academy because, with her status as the ghost Doctor, she didn’t need to. She simply told them the truth; she wanted to learn alchemy. But little did she know that she was the only student in the alchemy division and only 2 teachers. The president then explained that the other high ranking government teachers were lured away by other schools. The president and Vice President confirmed the rumors that the ghost Doctor only saves people he felt like saving. They then decided to facilitate her some other way as a reward. They also gave her a token that will allow her to leave school anytime she wants. The next day, Ouyang Xiu was waiting for the MC to show up but when she didn’t, he went to her dorms. When the MC arrived, she told him that she didn’t forget, she just didn’t feel like fighting him. When he tried to attack the MC, she called out for little black and stopped him. When she saw the person delivering food, she ran towards that person, grabbed the food boxes he was carrying before heading back to her room surrounded by formation. Nie Teng returns to the academy. He heard rumors about the MC the moment he arrived. He had a feeling that Feng Jiu was Feng Qingge and went to her dorms to verify and found old bai. The MC went to her brother's dorms but he was practicing with other students so she went to Ye Jing’s room and invited her out to go to town with her and showed her the dean’s token. When Ye Jing and the MC went out to town, the MC was faced with assassination by people from the Eight Empires; enemies of the ML. Ye Jing immediately broke away from the MC and ran to the Academy to get some help. The President, the Vice President, and other teachers went to her aid. The people from the Black Market also heard about her plight, but only the president and two other elders decided to save her. When they got to the scene, the MC was doing her best fending off 3 Yuanying cultivators and they felt the aura of an ancient beast. When help arrived, the MC asked them to protect her because she wanted to formulate her Foundation. They were surprised when she formulated a Heavenly Foundation. The assassins found out that she had a mystical spirit root and tried to kill her but they were killed by Mo Chen. Mo Chen then took her away when she finished advancing and fell unconscious. When Mo Chen reached the academy, he asked Ye Jing to dress her wounds and change her clothes. The MC stayed unconscious for almost two days. When she woke up, she got her brother to take a trip for her and head to the Black Market. At first, the elders who didn't come to the MC's aid were happy that they didn't because the three who did go didn't get any benefits. However, the MC asked her brother to bring advancement potions for the three, and the elders were jealous. The MC heard about what's happening with the Heavenly Dynasty Palace. It was now divided into 2 sides. The MC decided to reform the Heavenly Dynasty Palace. When she was on her way to find them, she met up with Bai Xiao, the past owner of Old Bai. He has been kicked out from his family. He told the MC was he came from a family of beast tamers. The MC decided to have him serve under her. She then met up with the past left-protector of Heavenly Dynasty Palace. His dantian has been damaged. The MC fixes it for him and he returns to being a Gold Dan. Du Fan, the Iron Fan Scholar, who was the leader of the bandits in the mountains, Xiang Hua, the left-protector, and Bai Xiao swore to the heavens to serve the MC and never betray her. While the MC was searching for the Heavenly Dynasty Palace, she came across lots of ghosts and were invited to a banquet with their master. They also kidnapped Bai Xiao, so the MC and the others had no choice but to go. 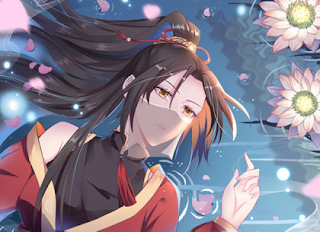 When they got there, the master of the ghosts was not some old man like they thought, but a beautiful woman by the name of Wanyan Qianhua and her and the MC got along really well. They vowed to be sisters. Wanyan Qianhua gave the MC a gourd that allowed her to collect ghosts and another treasure. In return, the MC gave her bottles of the potions.